If you haven't already, create your free trial account with CartStack. 1. Start by logging into your HiSITE account and clicking on the "Settings" page. 2. Under Settings page click on the "Booking Forms" icon. 3. Click on the cog wheel option and select "Content". 4. Scroll down to find the "CartStack" settings. You will need to enter the (A) Tracking Script, (B) Site ID, and (C) API Key. Log into your CartStack account to find the necessary setup information on the code/setup page. Here is a screenshot of the CartStack setup page showing you where to get this information. 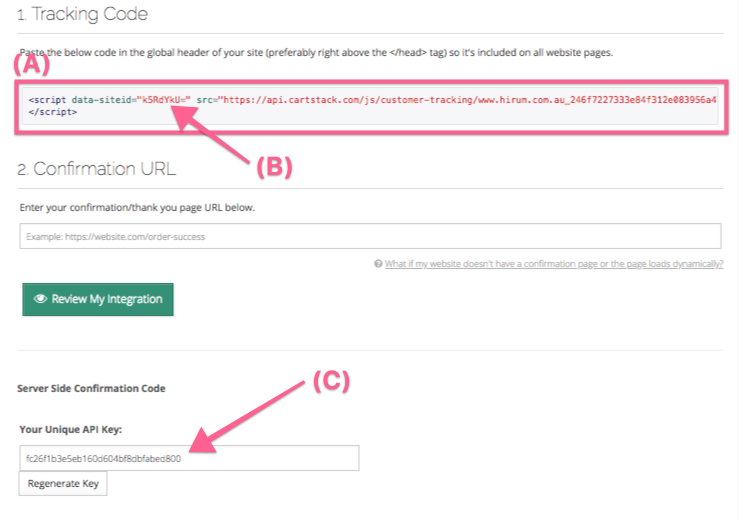 Note: for the (A) tracking script - copy the entire tracking code snippet, for the (B) Site ID - just copy the value of the "data-siteid" element (as shown in the below screenshot), for the (C) API Key - click on the "Server Side Confirmation Code (optional)" link which will open up the API information. 5. Once you have completed the setup in your HiSITE settings then click the "Review My Integration" button the CartStack setup page. This will send us a note so someone on our team can review your integration. Please email us (support@cartstack.com) with any questions.